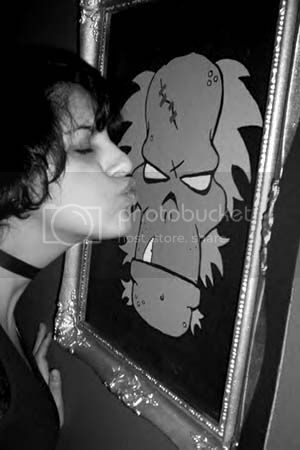 I just had to re-post this picture of a_vampire_soul havin herself a smooch with her own “Zombie Monkey” I did for her a few months back. I’d say the big, green fella found himself a very nice new home. If you happen to have shots of your own featuring you or your loved ones, pets, etc. defiling my artwork…please don’t hesitate…feel free to send me a copy or just post them here! Always room for more zombies in the wold of primates. The only one I can think of besides mine is that Cy-Gore character from the Spawn books. wow…i do believe you are correct – there are no others! well, in a way that comment disturbs me a little… heh. heh heh heh heh heh. you need to go here: http://www.munktiki.com/tikimugs1.htm they have zombie monkey glasses!!! sure they say SKULL MONKEY, but they are ZOMBIES, i tell you!!! i saw it like right after i made the post. i NEED both. i need EVERYTHING!!!!! i have a slight tiki obsession, as it is. Really good stuff on there. they have really neat ones on e-bay, too….FRANKENSKULL!!!!!! I’ll have to look a bit more. He the most attractive zombie monkey I have ever seen. and he’s all MINE!!! 😉 Thanks Squirt. That he is. Cheers, V.
That’s cool. Your pictures are bigger than I thought they were from looking at the regular posts you do. I really like a lot of your stuff. Thanks Forrest. Yeah…I do all different sizes. The large framed ones are my favorites to do but lately I have been working with smaller (9×12) wooden planks. Easier to get and I can sell them a bit cheaper than the framed ones.